This large barn has been renovated to enhance the charm of the old farm buildings, with many original features still remaining. Set into the hillside, it is reached by steps at the front of the property, and at ground level to the rear. The interior is decorated in a comfortable, Provencal style. The vast beamed double height living area (120 sq.m./1000 sq.ft.) comprises large comfortable sitting area with three large sofas, a huge open fireplace, satellite TV and DVD player; a dining area seating ten to twenty, and a large well-equipped open-plan kitchen with bar style bench and stools, dishwasher, oven and hob, fridge and microwave. A door leads onto a raised decked terrace with table and chairs for ten. The perfect place to enjoy the stunning sunsets with a glass of wine, the terrace has views of the pool and surrounding countryside. Below is a shaded area with built-in BBQ and two large tables and benches. 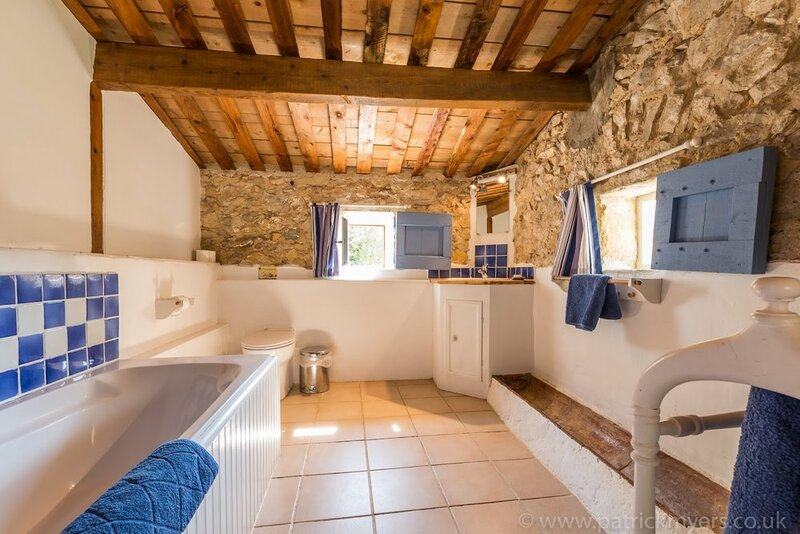 The laundry room has a washing machine, walk-in shower, sink and WC. The large family bathroom has a walk-in shower, bath, WC, sink, and bidet. 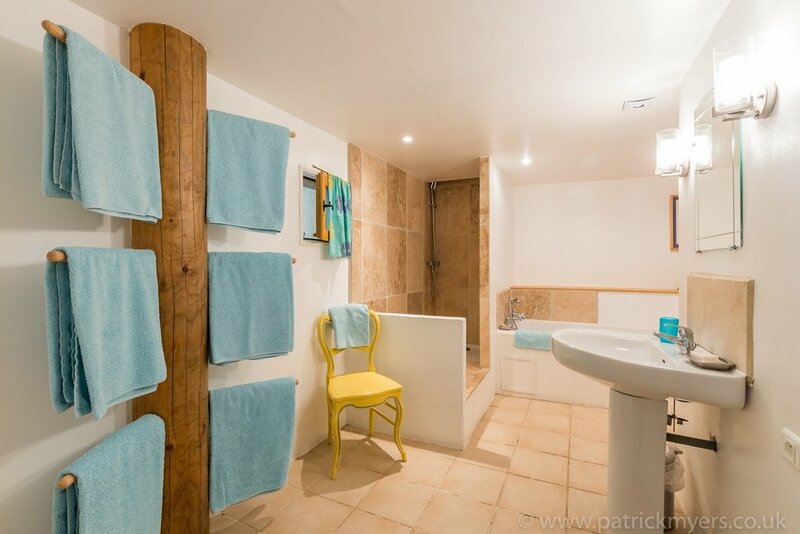 There are two double bedrooms with en suite bathrooms, one with double doors opening onto the decked terrace. Stairs lead up to a balconied landing, overlooking the living area and three twin-bedded rooms. 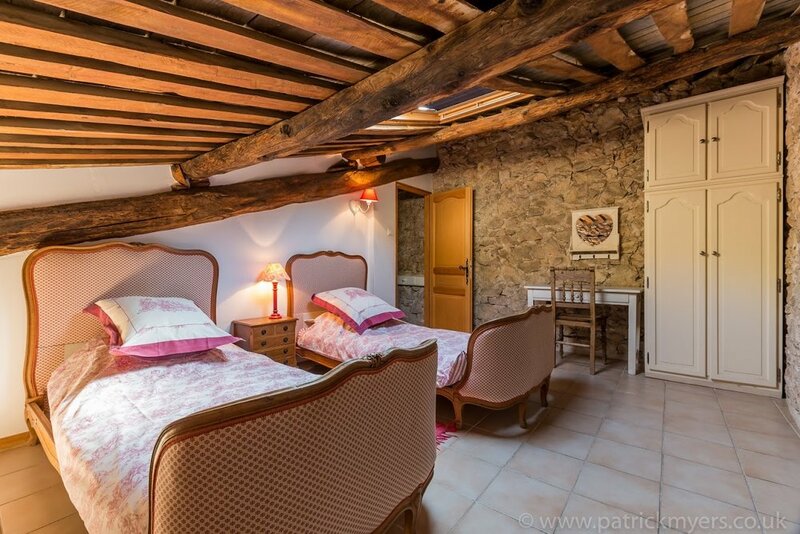 All are decorated in a Provencal style with comfortable beds, beautiful bed linen, and sumptuous towels. There is garaging for two cars and bikes.